Do You Love Your Home BUT Not How It Functions? ​D’Clutter Design is a professional residential organizing and staging business. Our goal is to help you re-organize your home to be both clutter free and visually appealing. 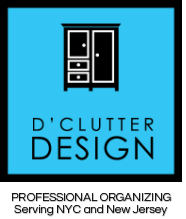 With a personable, no judgement approach, D’Clutter Design will help you solve your organizational design issues so you can spend more time relaxing and enjoying your home rather than stressing over it!